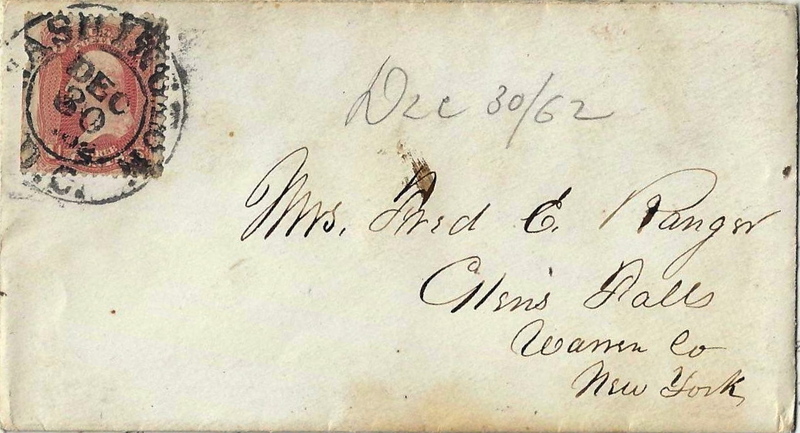 These five letters were written by Lt. Frederick E. Ranger (1833-1888) of Co. F, 22nd New York. 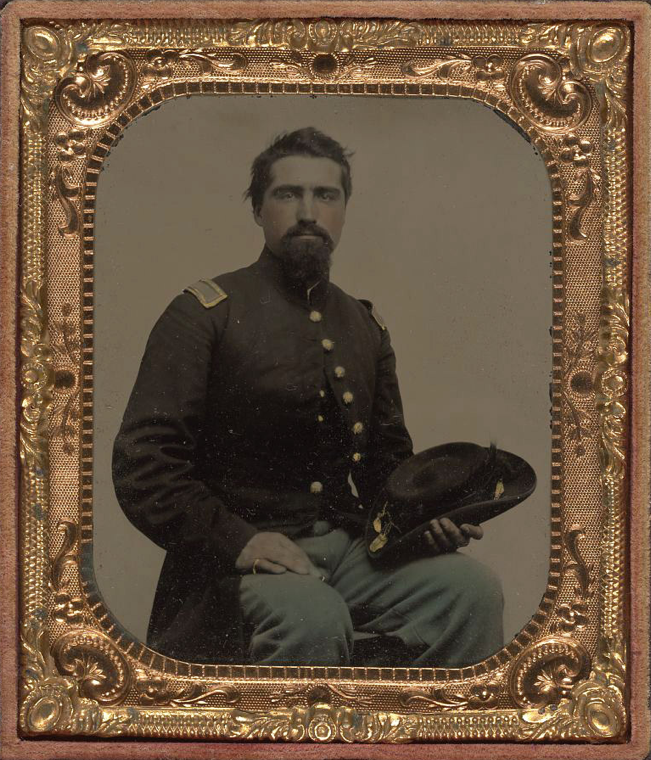 He entered the service on 5/7/1861, from Glens Falls, New York, as a 2nd Lieutenant, was promoted to 1st Lieutenant on 8/18/1862, and then to Captain on 11/5/1862. He mustered out on 6/19/1863 at Albany, New York. Frederick was the son of Samuel Ranger (1796-1872) and Caroline Payne (1800-1872). He was married in 1857 to Agnes Evens (1833-1896). Their daughter, Caroline (“Carrie”) Agnes Ranger was born on 1 December 1857. Another daughter, Gertrude E. Ranger, was born in 1861. 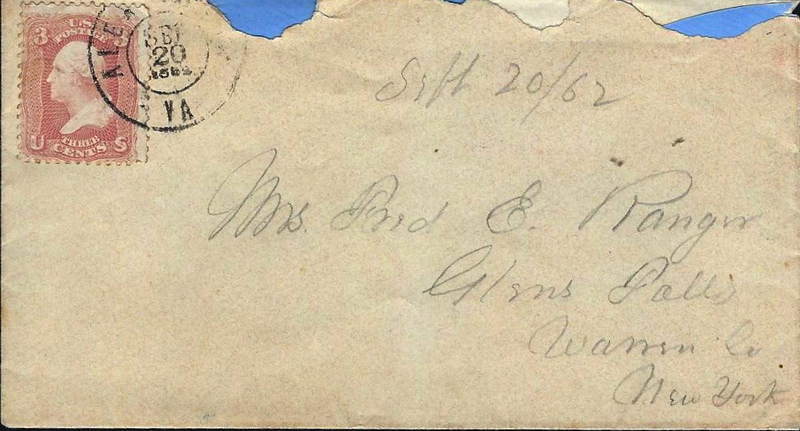 Three of Frederick’s letters appear on a website courtesy of Mike Northway dating from February, March, and November 1862. You see my darling I am domiciled here as yet & don’t know just what to do. Monday I went up to Washington with Col. Conners & staid that night with him & he started for his regiment next morning. The next day I went up to P. Campbell’s, 210 6th St. ¹ from Washington Co. & staid till yesterday. His wife was a Miss McIntosh. She used to go to school at Cambridge with Fan & I think roomed with her. At any rate, she knew Fan very well. Yesterday I came down here to get my overcoat & some things & have concluded to stay over a day or two. They have published a new order & when you report to join your regiment, they send you to the Convalescent Camp — that is the camp for raw recruits and soldiers getting well & set you drilling them & I won’t do it. To speak emphatically, I’ll see ’em damned first. Our regiment has had another battle [Battle of Antietam] & lost some but can’t hear much about it. There is a report that King’s Division is coming to Washington to recruit & one of the Lieutenants stopping here has gone up to Washington today to try & find out about it. One great reason why I am so anxious to get to the regiment is to get my letters. If they are not coming to Washington, I shall try & join them immediately [even] if I have to foot it. I suppose you are all well & have seen Dr. Ferguson & learned all about matters & things here. I don’t take but very little interest in the regiment — so many gone. Oh, how I want to see you all & it seems so strange to me that I haven’t taken French Leave & been home before this. I should [have] taken the chances of getting cashiered here but then I want to come home honorably so that I can hold my head up when I do get there. Kiss the children many times for papa & don’t let them forget they have a papa. Only 10 days more & the anniversary of our wedding day. Would that I could be home to spend it with you dearest. If they should send me up to the Convalescent Camp, I would for I’d resign & run away. ¹ The Washington D. C. Directory (1862) shows that Peter Campbell, a sutler, resided at 210 6th West Street. Following the battle of Antietam, the 22nd New York marched to an encampment between Sharpsburg and the Potomac River where it remained until October 20th, 1863. It then crossed over into Virginia. 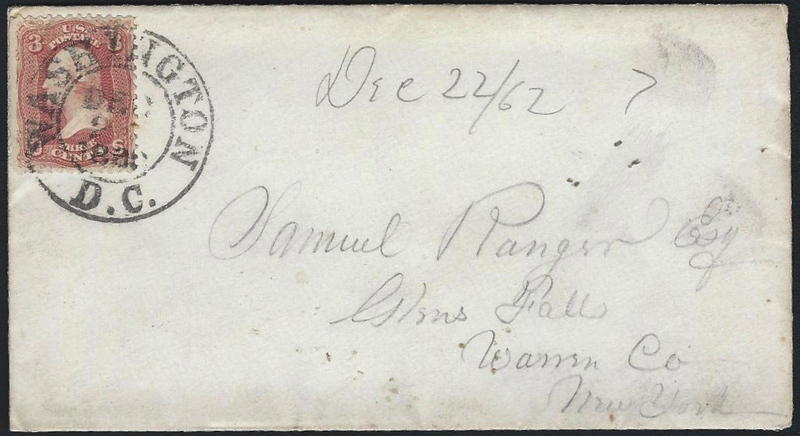 From the previous letter we know that Lt. Ranger was not with his regiment in the Battle of Antietam but probably joined them in Maryland sometime in late September or early October. It has been a cold, cloudy, gloomy day & has commenced raining & bids fair to be a heavy storm if not too cold. Another reason for its being more gloomy is the thinness of our ranks. We only had 80 at dress parade tonight where once we were 800. And one particular reason why I am lonesome — I haven’t had a letter from you since my return. I can imagine you all seated round the fire tonight, perhaps talking of Fred & Floy & Carrie asking about Papa & “Pop.” Rather a pleasanter picture than camp tonight & the only away for me is to imagine myself in the rocking chair talking with you all with my babies on my lap. The majority of our boys are short of clothing but it is on the way. Dr. [Austin Wells] Holden goes to Alexandria tomorrow & may get a furlough to come home. [Capt. Orville B.] Smith isn’t well & I have command of the Company F & A which are consolidated for the present. [Jeb] Stuart’s cavalry have made a raid into Pennsylvania & last night at 12 I was called up to have my company draw rations and cook them & be ready to march at a moment’s notice but we did not go — & I hope we won’t. Last night myself & several other officers attended a lodge at Sharpsburg & were kindly received & spent a very pleasant evening. We are located a short distance from Sharpsburg & about a mile from the battlefield of Antietam & ½ a mile from the Potomac. Just been to breakfast — not very hearty — bread & applesauce & coffee. It is a little warmer than yesterday. We are having a sort of dry rain — cloudy every day. A great many rumors in camp concerning the raid into Pennsylvania but nothing substantial as yet. Hoping to have a letter from home today. I kiss you all. I received your letter of the 9th this morning & such a glorious letter. I was calculating to answer it at length tonight but we have just received orders to pack up all but striking tents & be ready to march at a moment’s notice with two days rations so I have this ready to send if we move. Receive my warmest kisses & the blessing of Heaven rest over you & the darling children. It is almost 8 o’clock and we still remain here & I am in hopes we may not have to move. It commenced raining just after dark & still continues & bids fair to be quite a storm. There has been heavy cannonading on the other side of the river all day I should judge some 6 to 10 miles distant — but what the cause & what the result, I cannot tell — undoubtedly a battle. This morning we laid out the camp anew. [Capt. Orville B.] Smith & I got a new tent — put it up & just got our beds nicely up & things fixed before dark. I am sitting on my bed writing on my lap — candle stuck in a bayonet & bayonet in a musket basket & fixed to write. Smith keeps up such a talking I can hardly make it out. I have devoured your letter two or three times today. It is so long you know since I have had & it seemed so cheery to hear from wife & little [one] once more. But I suppose, darling, you are as glad to receive letters from me as if they were engraved upon a steel plate. If you are, you can judge my feelings in regard to yours. What difference can you suppose the turn of a fetter makes with my joy at getting a letter from you. The only thing that has pained me was your saying that you should not write as often as formerly — but I cannot believe that, for I know you love me as much as ever. Your oft repeated words — come home — strike with a re-echoing wish upon my heart & rest assured, darling, my heart aches to be with you & as soon as I honorably & consistently can, I shall hasten, — “where my heart is turning ever” — to fold you all in my embrace till our final farewell. Keep up a brave heart my precious one. We are not living very high just now & visions of Mother’s glorious dinners most make my mouth water. Lt. [Daniel] Burgey was home when I was & married a Miss Garfield of Schroon. I wrote Agnes a short letter this morning enclosing twenty-five dollars & was intending to write her a long one this evening, but as I am very dampish & sleepy, will address it to you & it will do for all and will write her a longer one tomorrow or rather the next opportunity. I wrote to Agnes a long letter Thursday, August 18th, with an account of the Battle [of Fredericksburg] & our doings to that date. At that time we [were] lying about a mile from the Rappahannock. Friday (19th) was terrible cold. Our regiment was ordered on picket down on the river bank. I was having a little touch of some sore throat & it was so cold & looked like a storm. I got excused & stayed by my stove. They suffered terribly with cold. Saturday morning (20th), the regiment was relieved, broke camp & took up our line of march for Belle Plain by the way of White Oak Church. I tell you, you have not seen any very colder weather up in Glens Falls than we had Saturday — ground frozen harder than a rock & water in the boys canteens froze solid while marching along. We marched about 10 miles & stopped here in not a very good place. They say we are about 4 miles from Belle Plain. That night we arrived, the train did not come up & I had the pleasing prospect of spending the night without a blanket. Company F boys laid in a good stock of dry cedar rails & I sat up & kept a rousing fire going all night, managing to catch a short nap now & then. Yesterday expected to move all day so did not put my tent but got my blankets & slept warm as toast with Sal & Dixie. Today we did not move & so have put up the tent & stove. Expect to move tomorrow. Don’t know where we shall go but should not wonder if nearer to Belle Plain so as to be nearer our supplies. Everyone talks of winter quarters as a sure thing but I put no trust in winter quarters till it is a sure thing, though I think very likely that we will lay still some time. There is a rumor also that we will soon be mustered out — too good to be true. When I got just here, I got up & went over to Brigade Headquarters, called on Col. Phelps & then went in & saw Jimmy S. He says we are going to Belle Plain to stay & that Mrs. Jimmy S. is coming down. I have just got back & it is after taps. I received yours & Agnes’ letters of the 14th & 15th this morning acknowledging the receipt of the Draft. It was as much as I could spare though we have two months more nearly due but we may not get our pay for two months longer. I am glad you have been below & hope you will do a good business about these days. Oh, how I could enjoy being home the Holiday. You must write me all about what you purchased below & what the darling children got in their stockings. Jimmy Schenck says his wife is coming down here about the 1st of January. I went over to see him about having a box come from home & he said she could take care of it just as well as not. But I am afraid it would be too much trouble for her & I left him with this understanding that if she could not bring it about the time she starts, you should send it by Adams Express to Washington & when he goes up after his wife, he will bring it down to me. And now, for a memorandum of things I want. First, my new boots. One of the best diaries you have, a wallet — a real nice one or none at all, those long stockings, & as for other things, whatever is handy. Nut cakes isn’t bad fodder for a poor soldier & bye the way, in your next letter, please inform me if you have paid William Peat for my last suit of clothes. If not, please let me know & I will send him the money & order a new suit. I believe the last suit was twenty-five dollars. Find out & if you have not paid him, tell him I will send him the money in return mail. I have got to have some new clothes before long & when I send him the money will order a new suit. I cannot stop to think that I am here & 3 days more is Christmas & I so far away & cannot be home anymore than if in jail. Rest assured I will write every opportunity & you must do the same. Merry Christmas to all & thousands of love. Good night. 1862 has almost gone carrying with many a blasted heart & thousands of unmarked graves & as I look at the thinned ranks of the 22nd [New York], I feel than I can hardly feel thankful enough that I am still spared to greet the coming 1863. There has nothing new transpired since my last written the 24th. Christmas was a beautiful day — the air balmy as May. Everything passed off as usual in camp. Though by the way we did have a little variety in the shape of dinner. We had Cracker Pudding. First soaked the crackers in water to get some degree of softness, then made them as fine as possible & stewed them up over the fire & then eat them with milk, butter, sugar, & wine sauce. We managed to procure a pound of butter for 60 cts. & we had a present of a bottle of claret. Wasn’t that a feast. Yesterday we had gingerbread & cheese but to day we have had to come back to our old fare. Provisions are mighty scarce & somewhat high in price & if anyone ever says anything about the big pay of officers, you can tell them that it takes something to purchase butter at from 60 to 75 cts., cheese at 40 cts., apples 3 for 25 cts. Little round gingerbread $2 per dozen & everything in proportion. Yesterday we had a gale of wind nearly all day [and] did not stir out much. About ½ past 9 last evening, Lts. [Daniel] Burgy, [Addison L.] Estabrook, & myself were waiting in my tent for the mail to come. One of the 24th came along & told us the mail was at Brigade Headquarters, went up & told the Chaplain ¹ but he & his serf had retired & were too lazy to get up & attend to, so Burgy & I went over & brought it over to my tent & I found a letter from you & Father of the 21st & 22nd & some papers which paid me well for the trouble & no thanks to our hard working chaplain. I see that at the time those letters were written you had received none of my letters since the Battle [of Fredericksburg] & you had ought to have received them by that. However, your anxiety must be relieved ‘ere this & probably have found out that if it had been possible, Fred’s letters would have been prompt as ever. You spoke of young Stewart. He has left the 93rd, I understand, & gone into the Regular Cavalry. Report says he has fallen from grace & can swear like a trooper. I see Charly — Gen. Gray’s son — has been killed. Another of the old military associates of the 31st gone & so young. Very sad. I am anxious to hear how your Christmas passed & if Grandpa fulfilled his office of Deputy Santa Claus to the satisfaction of all concerned. I can imagine with what zest he would enter into it. And bye the way, if you have not started my box, tell father to put in a small ___ memorandum & one plain memorandum, 3 or 4 Fabers. pencils No. 2. If you see that piece concerning the Iron Brigade in the papers, cut it out & preserve it or anything else speaking of the 22nd. Today we have had regimental inspection & it is almost time now for dress parade. We expect to live next week. Our quartermaster-sergeant [David W.] Thompson, & Willy Allen are going to start an officer’s mess. Thompson has gone to Washington to procure the essentials & they propose to commence Monday. I have sent to Washington for another army trunk by Thompson so I can keep my things half way decent. I shall have to wait & finish this after dress parade. Well darling, dress parade is over & nothing new except I am Officer of the Day tomorrow. Supper is dispatched consisting of hard tack & coffee. Tomorrow is Sabbath & I shall probably have to go to work at my muster rolls while you are at church. It is about a 3 days job & has to be done by muster day which is the last day of December. As this will not go till 2 P.M. tomorrow, I all try & drop in a few words tomorrow so I will kiss all my darlings good night & close with a wish that Gov. [Horatio] Seymour will recall the 2-year troops as soon as he takes his seat. ¹ Regimental records indicate that Henry H. Bates of Glen Falls, New York, was the chaplain. He enrolled age age 53 to serve two years with the regiment. 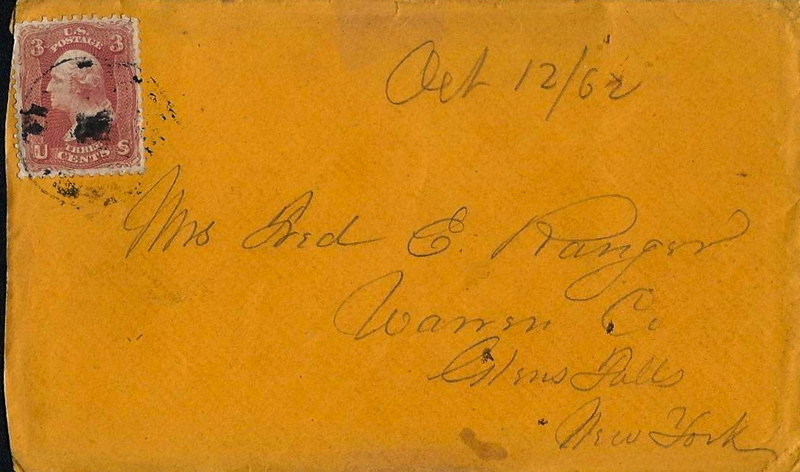 I own a few Fred E. Ranger letters (including 2 of the ones you show here). I note that you have an image of what he might have looked like. I have found conflicting images of him on different sites and am trying to determine which image is correct. Do you have any information that would indicate whether the image you show is consistent with what he really looked like? If I wanted to add other letters how would I do so? I’d like to send you links to the images I’ve found of Ranger online to get your opinion. You have my email address. If you email me directly perhaps I can send those. It doesn’t seem like I should just put them in the comments section on the page.